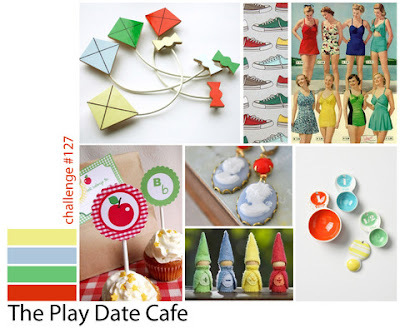 If you want to see how I created this, pop over to the Sizzix blog for step-by-step photos and instructions. I wanted to do a clear card today. The background transperancy is dry embossed. The four panels were stamped with bright colours Archival ink. 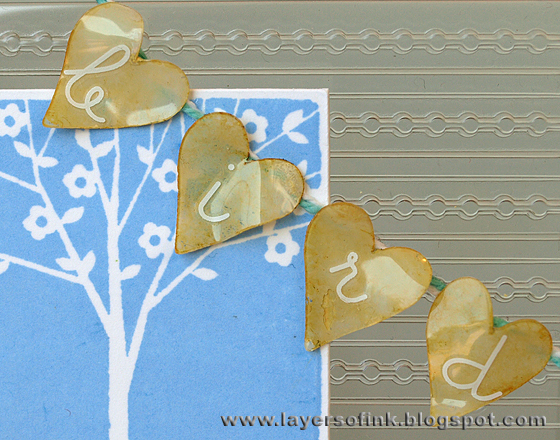 Four small hearts and one bigger heart were die-cut from clear modeling film. The tiny heart is such a great little size. The small once were inked with yellow alcohol ink and the bigger heart with two shades of pink, finishing off with white alcohol ink to make the opaque. Rub-ons were added to the hearts and then they were heated and shaped. Supplies: Hero Arts stamps: Untitled Love AC004, Trees of the Season CG208; Sizzix Beaded Ribbons embossing folder, Hearts Movers & Shapers; Ranger Archival ink Chrome Yellow, French Ultramarine, Sap Green, Rose Madder; Alcohol ink: Sunshine Yellow, Picket Fence, Shell Pink, Mountain Rose; Stamper’s Anonymous clear modeling film, American crafts and Basic Grey rub-ons. I loved the transparent images on the text background and knew I wanted to do something similar. 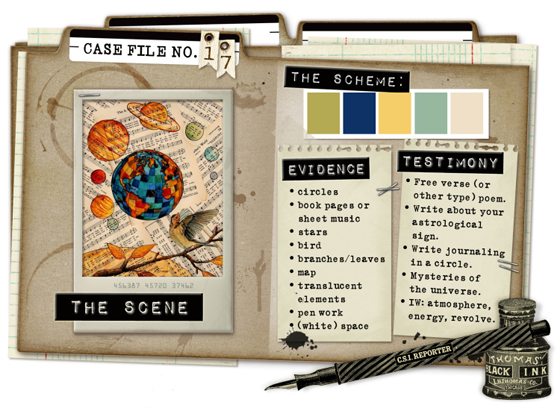 Of the evidence items I used: circles, map, transparent element where the background shows through, stars, birds, And from the testimony: I placed my title in half a circle and the layout is about a song I made up for my son, not really a free poem, but something similar. I used watercolour paper for the background. It was first misted with water and dipped into a pool of Antique Linen Distress Stain, giving it a nice cream colour. When dry, a music stamp was stamped repeatedly across the page using Archival Ink Cobalt, and first to third generation stamping. The images were stamped on top with Jet Black ink and coloured with watercolours. It is a bit tricky to match watercolours to the colour palette since they dry lighter, but I hope they are close enough. My sister made up a short little song about cars which I have been singing to my son a lot. Because he loves all vehicles, I started adding other vehicles to the song, and especially those he has seen during the day. So the song is a bit different all the time. It includes a favourite part of him going in a little wagon pulled by a tractor, but I didn’t have any tractor stamps (or bus stamps). I know have to sing this song every evening, often many times, and the title of the layout is him asking for the song. I placed the story about the song and the song itself (one of its many versions) behind the photo, which opens up. Supplies: Hero Arts stamps: Going CL478, Past Times AC007; Stamper’s Anonymous Tim Holtz: Odds and Ends, Air Travel, Warehouse District, Beeswax: Globe, Viking boat, sailing boat; Oxford Impressions truck stamp; Artistic Outpost: Ephemera Backgrounds, BlueBird; Technique Tuesday border stamps; MME Portobello Road stamps; Wildlife Enterprises train stamps; Sizzix: Mini Labels, Mini Gears, Gadget Gears; Distress Stain Antique Linen; Distress Ink Faded Jeans; Daler & Rowney watercolours; Heidi Swapp chipboard stars; felt; October Afternoon letter stickers; grungepaper; BG patterned paper. 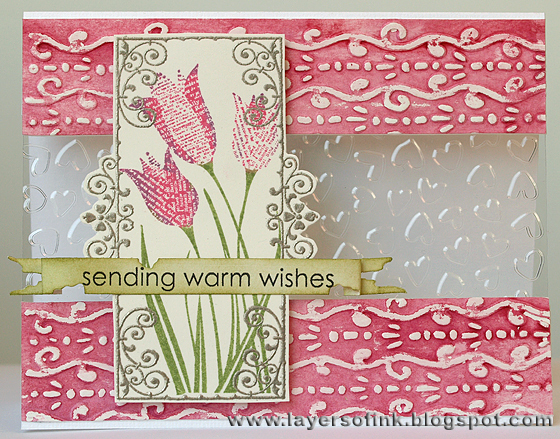 The frame was embossed with Platinum powder and the tulips were inked with Rose Bud, Sweet Plum and Bamboo Leaves Memento ink, masking off one half of the stamp. Thank you for looking! Don't miss the sneak peak below. Supplies: Hero Arts stamps: Frame with Scrolls K5541, Newspaper Tulips K5576, All Occasion Messages CL272; Sizzix Tattered Banners Sizzlits, Curlique & Hearts embossing folder; Memento Ink: Rose Bud, Sweet Plum, Bamboo Leaves; Peeled Paint Distress Ink; Ranger Platinum embossing powder; Daler & Rowney watercolours; watercolour paper; acetate. 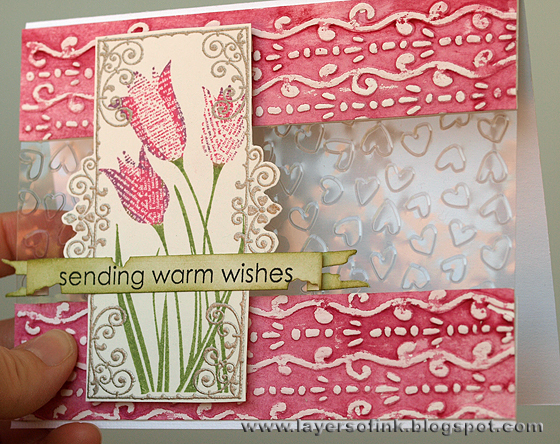 Today I have a card featuring a piece of mini-scenic stamping. It is for the Craft a Scene April challenge to use silhouette stamps and for the Simon Says Stamp and Show challenge to create a project with a favourite word (I used one of my favourite words, 'nature'). The deer and the tree trunks were stamped on white cardstock with Archival Ink Sepia. A bit of texture was added with a bush stamp and then the scene was sponged with Distress Inks (Antique Linen and Vintage Photo). 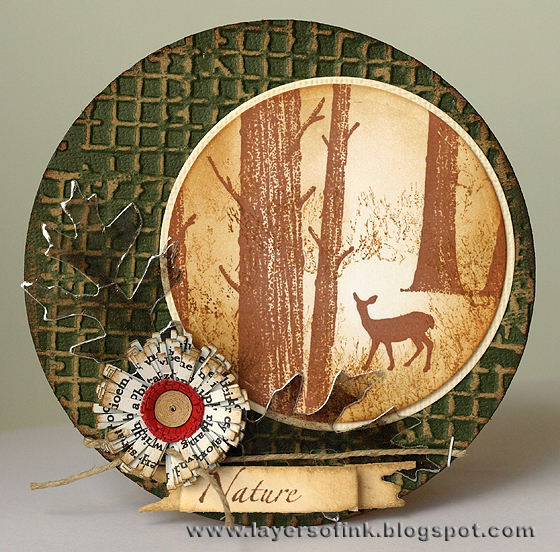 The background is kraft core cardstock which was cut into a circle, embossed and sanded. 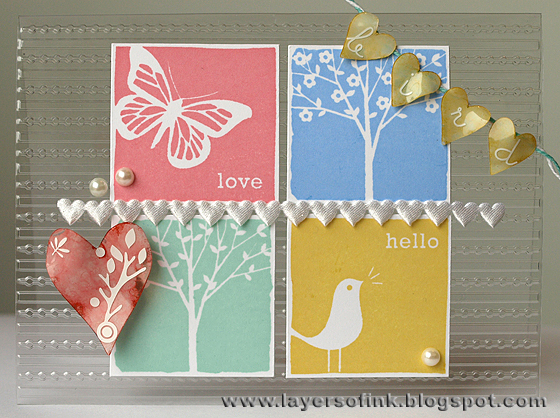 To add to the nature feeling of the card, I die cut two leaves from a sheet of mica. 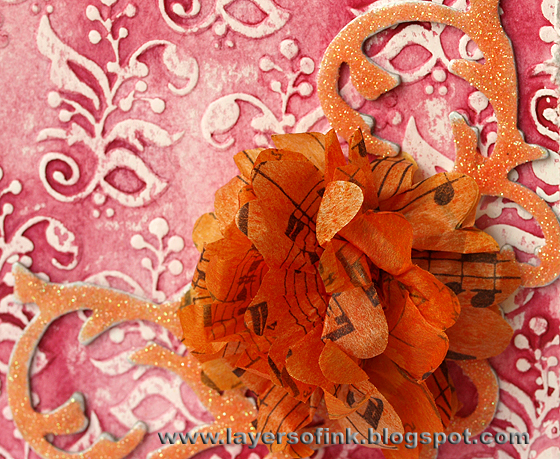 I also found a home for one of the quilled fringed flowers I made for my tutorial in February. The sentiment was stamped with Archival ink Coffee on a tattered banner, which was first inked. 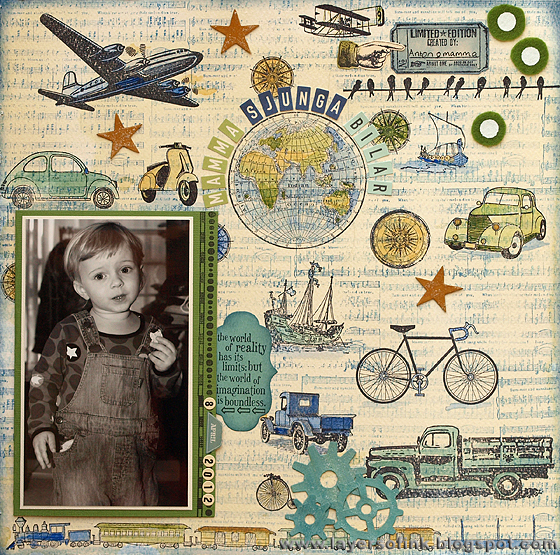 Supplies: Stampscapes: Tree Trunk Trio 088F, Doe 229A, Bush 191A; Sizzix: Framelits Die Set Circles, Mini Tattered Leaves Movers & Shapers, Tattered Banners Sizzlits, Gridlock texture fade; Distress Ink: Vintage Photo, Antique Linen; Archival Ink: Sepia, Coffee; Core’dinations Tim Holtz kraft core cardstock; 3 mm and 6 mm Lake City Crafts quilling paper; October Afternoon patterned paper; Ranger manila cardstock; US ArtQuest mica; twine. I played around with some watercolours and different resist techniques and thought that a white wax crayon might work well together with a dry embossed paper, rubbing the crayon on the embossed parts before painting. I thought the result was pretty cool, lots of texture. I’ll do a tutorial on this another day, totally forgot to take step-by-step photos as I was busy with the backgrounds (I made a whole bunch). I mixed up the right shade of pink in watercolour paint and painted it rather unevenly on the embossed watercolour paper, letting the paint pool in some areas. A length of tissue paper was coloured with Spiced Marmalade Distress Stain and dried with a heat gun. Then I made a flower in the same way as Tim did during 12 tags of Christmas, here is a link. The flourishes were cut from grungeboard, painted white and then coated with glossy accents and orange glitter. I’ve loved using the Tattered Banners for my sentiments lately. I often stamp my sentiments on just a strip of paper, and the banners add a bit more fun to that. Supplies: Hero Arts Thoughtful Messages CL184; Sizzix Botanicals embossing folder, Mini Flourish Movers & Shapers, Tattered Banners Sizzlits; Distress Stain Spiced Marmalade; Tim Holtz terminology tissue wrap; grungeboard; Daler & Rowney watercolour paint; white wax crayon; Making Memories glitter. The boy was stamped with Archival Jet Black in on watercolour paper and coloured with watercolours. 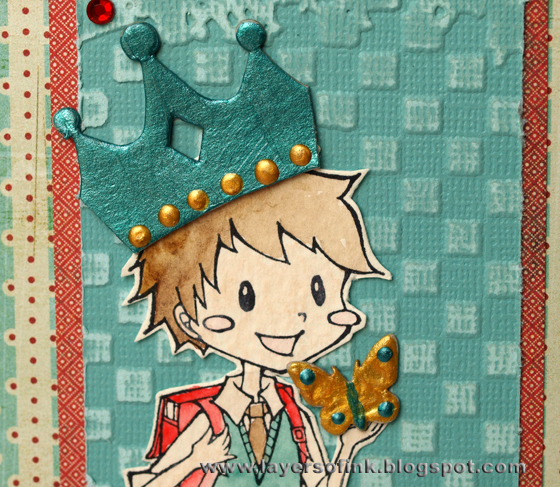 Originally he was holding an apple, but I gave him a chipboard butterfly to hold instead and he also got a little crown. Both pieces were painted with Adirondack dimensional Pearls Paint (Stream and Butterscotch). The crown was too big, so I cut off a bit on each side. 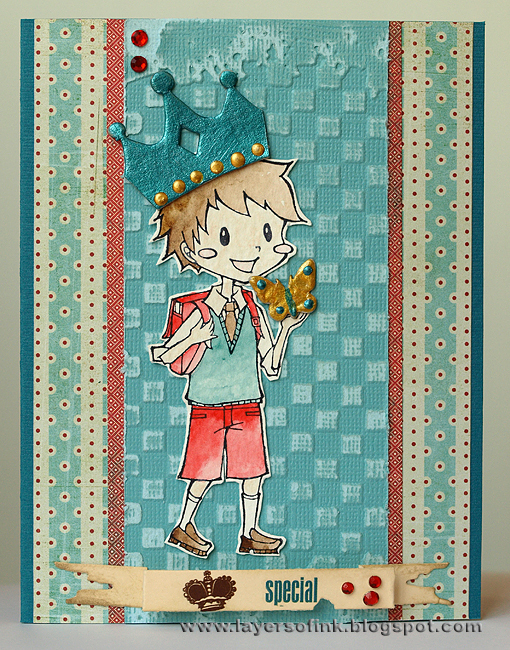 The background is dry embossed and sanded Core’dinations cardstock, and two pieces of patterned paper. For the sentiment, I cut a Tattered Banner and added a crown and the word ‘special’ with rub-ons. I need a lot of kiddies birthday cards and this one will fit perfectly. Thank you for visiting! I hope you can play along with us. 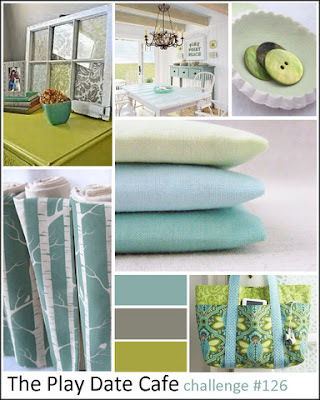 You might win a guest designer spot! Supplies: Sparkle Creations Backpack Oliver stamp; Sizzix Tattered Banners Sizzlits die and Checkerboard texture fade; Daler & Rowney watercolours; Core’dinations Ranger cardstock; Maya Road and Heidi Swap chipboard; Adirondack dimensional pearls paint Stream and Butterscotch; Creative Café rub-ons; Ranger manila cardstock; Kaisercraft rhinestones. 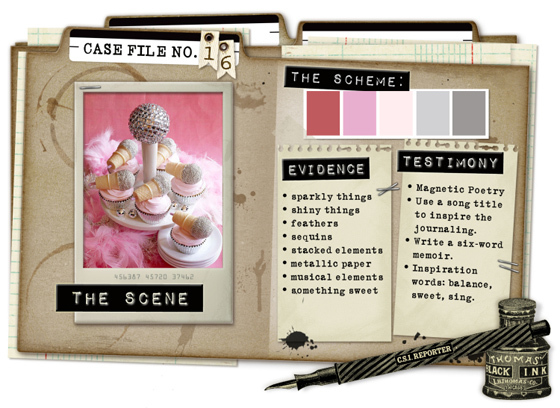 From the evidence items I used: sequins, something sparkly, musical notes (stamp) and something sweet (strawberries). Testimony: I used a song as my title and also journaled from the angle of the song. 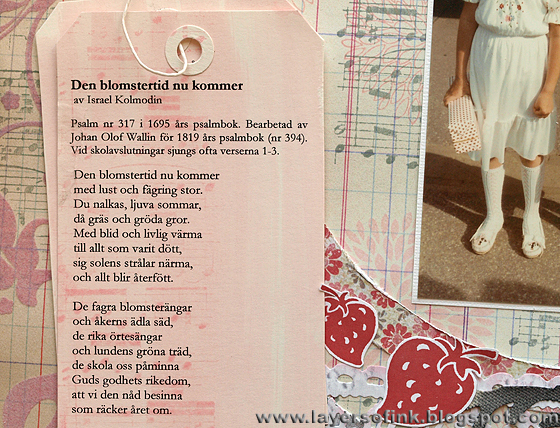 It is a Swedish summer song that is sung at the last day of school before summer (when the photo I used was taken). I journaled about my memories about the song and about the last day of school before the summer holiday and about the clothing me and my sister is wearing on the photo. Strawberries, sunny weather, the freedom of summer holidays, the nights being light etc. I also wrote about the porcelain doll which is in the parcel I am holding. I won it in a lottery in the class, it was first prize and I had it on a shelf above my desk for many many years. 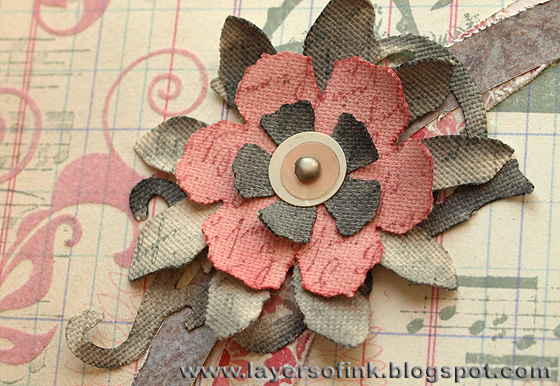 I found a ledger patterned paper in my stash with a velvet swirl at the one side, and it fit well for the case file, so did the flower paper with the grey paper at the back, from which I cut two circles. I stamped flowers in two shades of pink, musical notes in grey and a summery silhouette stamp in grey on the background patterned paper. The strawberries and clef were stamped with Vermillion Archival Ink. 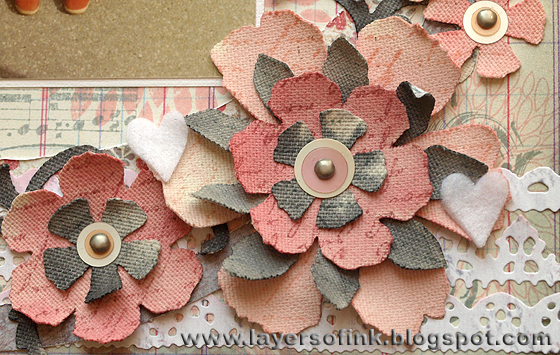 This page needed some flowers, so I cut a bunch of flowers from natural canvas using the Tattered Florals die. They were coloured with Distress Stains, smeared on my craft sheet. I misted the flower before dragging it through the ink and lifted some of the colour off with a paper towel from the flowers that were too dark. For the light pink flowers I used Spun Sugar, for the darker ones Victorian Velvet and for the grey ones Black Soot. I liked the grey that I got from the black Distress Stain – I misted them again after dragging through the ink and then dabbed off ink with a paper towel to get the right shade of grey. I cut three pieces of Vintage Lace from white eyelet patterned paper and inked them a bit with Spun Sugar. The felt hearts were cut with two sweet little heart dies. I particularly like the smallest one. 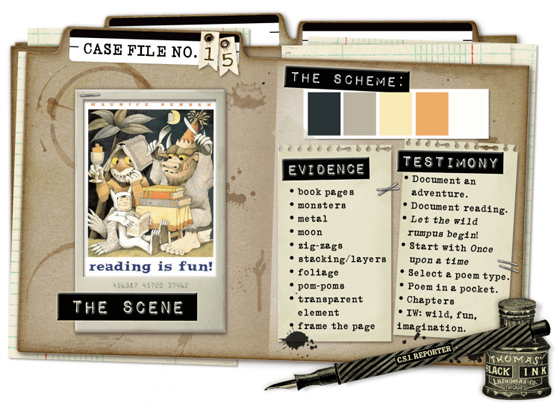 The journaling is typed on two tags tucked behind the photo. After cutting the tags out, I inked them lightly with Distress Stain Spun Sugar, dried with a heat gun and then stamped the music note stamp on them using the same ink. On the first tag, I printed the song and on the second one my journaling. 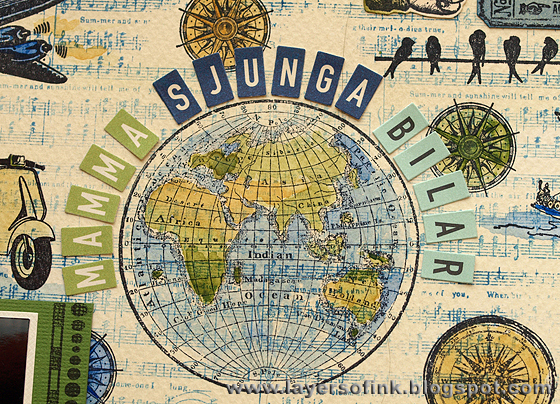 The title was stamped on the background ledger paper with the Weather Wane ink. Thank you for visiting! I hope you can play along with us this week. 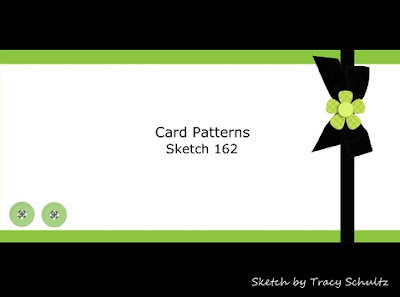 I'll be back later today with my Card Patterns card. Supplies: Hero Arts stamps: Musical Clef CG279; Dancing with Flowers CG266, Large Solid Flower CG248, Small Solid Flower CG251, Small Open Flower CG250, Farmer’s Market CG384, Old Letter Writing S4878; PSX and EK Success letter stamps; Beeswax bird stamps; Sizzix Tattered Florals Bigz die, Tag & Bookplates, Vintage Lace Sizzlits, Hearts Movers & Shapers; Distress Stains: Spun Sugar, Victorian Velvet, Black Soot; Distress Ink: Spun Sugar; Jenni Bowlin ink Weather Wane, Chewing Gum; Ranger Archival ink Vermillion; Memento Angel Pink; Making Memories and Fancy Pants patterned papers; natural canvas; felt; Kaisercraft rhinestones; sequins; brads. Streak the Stains over the canvas, mist a bit with water. 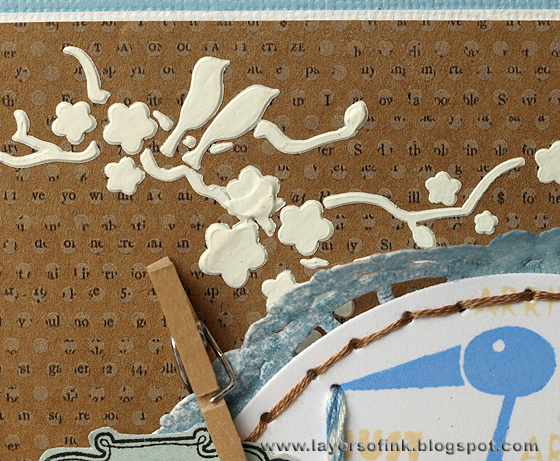 The canvas was adhered to cardstock when dry to give it more stability for the die cutting. The front of the card was kept fairly simple. A piece of watercolour paper was misted with water and then dragged through Distress Stains smeared on my craft sheet (Mustard Seed, Wild Honey, Spiced Marmelade). I dried it with a heat gun and embossed the ticket with Platinum embossing powder. The plane was embossed on white cardstock with the same powder. 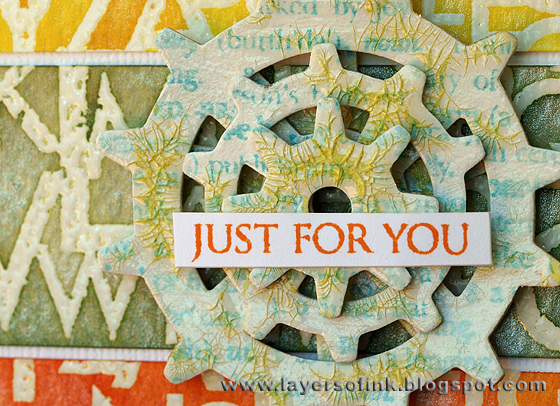 I used a zig zag On the edge die to cut the orange paper as well as a strip of white paper. 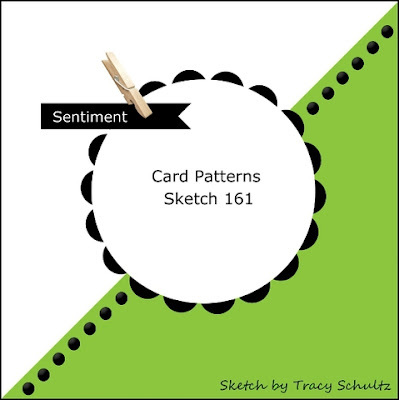 The sentiment panel was die cut from the canvas and stamped with Black Soot ink (mist the stamp a few times first for a better impression on the canvas). I die cut the pop up from canvas (first adhered to cardstock) and stamped it with a map stamp using Faded Jeans. A slightly larger piece was cut from the watercolour paper and I used the pop-up die to cut the zig zag edges (adhere the paper with repositional adhesive to the die to get a straight cut). 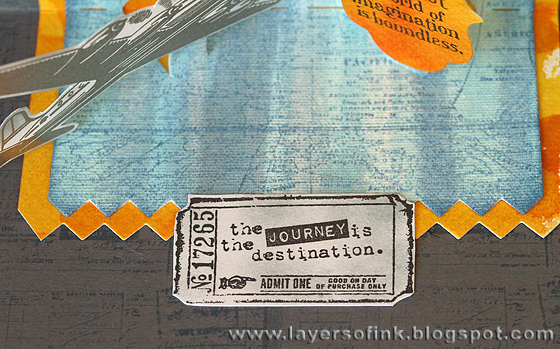 The sentiment panel was also cut from the orange paper and the sentiment was stamped with Versafine Onyx Black ink. A larger version of the airplane stamp was embossed with Platinum powder, as well as a compass. All the white pieces were sponged a bit with Weather Wane ink. 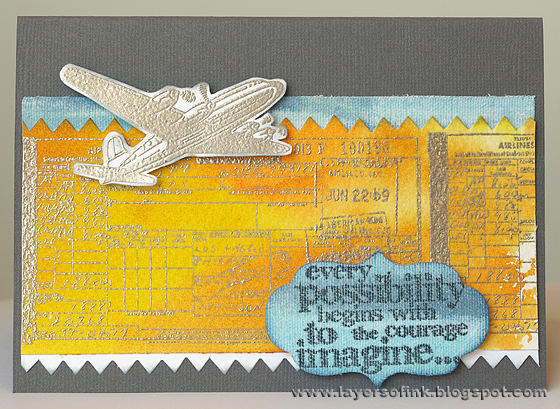 The base cardstock was stamped repeatedly with a smaller version of the ticket stamp using Faded Jeans ink. It is very easy to assemble the pop-up. After folding out the two pop-up panels (the die scores the card too), put strong double-sided tape at the edges and at the fold of the die and then adhere it by lining it up with the fold of the card. The pop-up panels face inwards which gives a great look to the card, the plane looks like it is going to fly right out into the map. 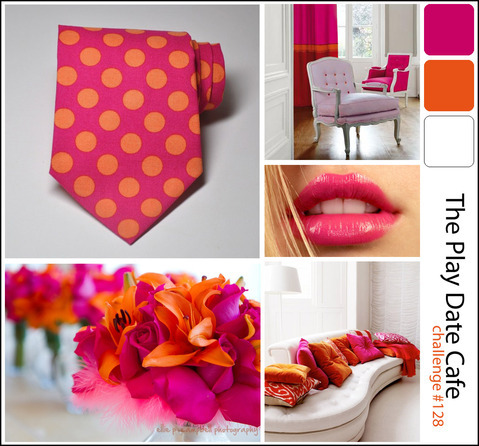 Finally, a ticket and another sentiment was stamped on white paper and sponged with Weather Wane ink. Supplies: Sizzix ZigZag 3D Pop-up Bigz die, On the Edge Mini Scallop & Pinking; Mini Styled Labels Movers & Shapers; Stamper’s Anonymous Tim Holtz stamps: Warehouse District, Air Travel, Odds and Ends; Distress Stains: Tumbled Glass, Stormy Sky, Picket Fence, Mustard Seed, Spiced Marmalade, Wild Honey; Distress Ink: Faded Jeans, Black Soot; Jenni Bowlin Weather Wane ink; Ranger Platinum embossing powder and white sticky-backed canvas; watercolour paper. Today’s card is for the Inspiration Journal April challenge to use a watercolour technique. I made this card the cling wrap and watercolour technique which I shared here and here. First, the flowers were white embossed on watercolour paper and then yellow and green watercolours were painted on top. The embossing resists the paint. A piece of cling wrap was wrinkled to make a grassy pattern and placed on top of the wet paint. It was left there until the paint dried. 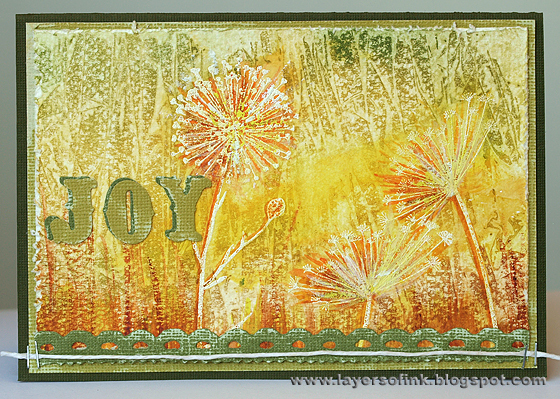 A bit of orange was dry brushed at the bottom of the card and painted to enhance the flowers a bit. The letters were die cut from Peeled Paint and Shabby Shutters Core’dinations cardstock, sanded a bit and layered on top of each other, to create a shadow effect. 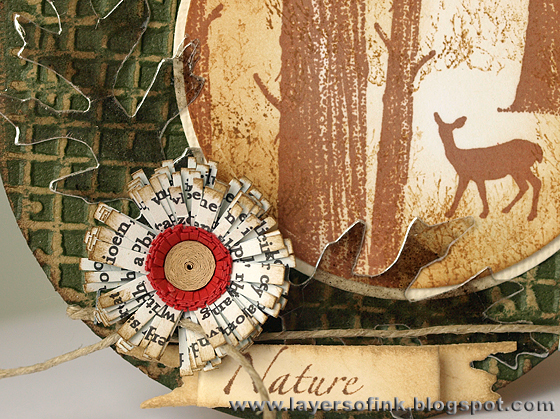 The Vintage Lace was die cut from the darker green paper. 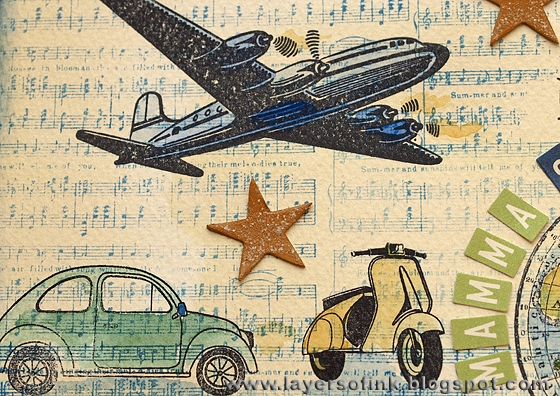 Supplies: Hero Arts stamps: Silhouette Burst H5312, Silhouette Spray G5311, Sizzix Vintage Market and Vintage Lace Sizzlits; Core’dinations Ranger Peeled Paint and Shabby Shutters cardstock; Daler & Rowney watercolours; Ranger Seafoam White embossing powder; twine; watercolour paper. Cut a length of manila cardstock 12 in long and just wide enough to fit the Tag & Bookplates die. 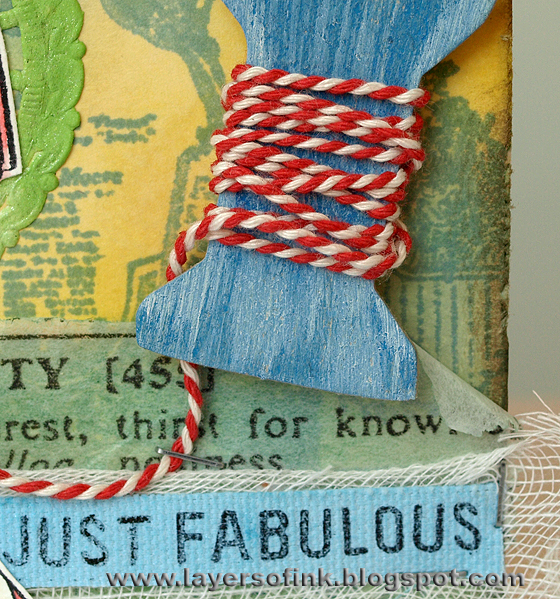 Fold it in half and place the cardstock on the die, just below the top cutting line of the tag. Then you will get a tag which is folded at the top. This tag is also a bit shorter than the ordinary size, which fits nicer into an envelope. 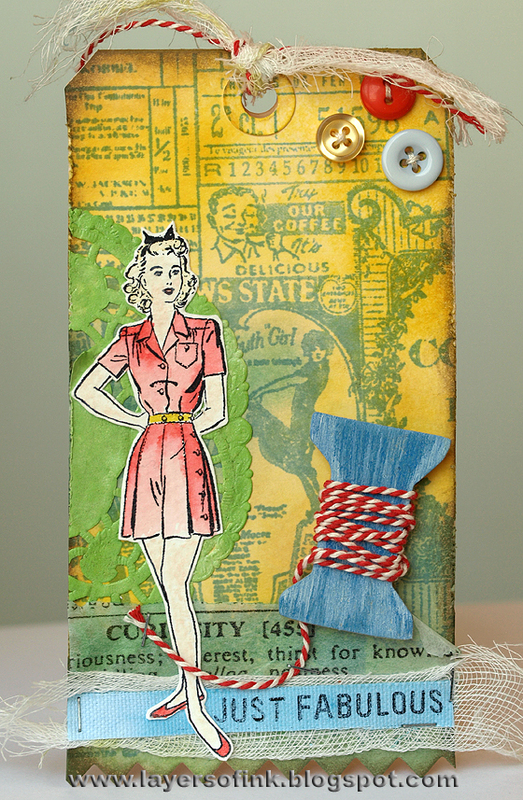 I used the Zig Zag pop-up die for the base of the tag, place the tag just across the one zig zag end and die cut. I held the tag in place with a small piece of repositionable double-sided tape. The tag was sponged with Mustard Seed, Scattered Straw, Bundled Sage and Evergreen Bough Distress Ink and misted with water. After it dried I stamped it with French Ultramarine Archival Ink, swiping the ink across the stamp to get a distressed look. The woman was stamped with Archival Ink Jet Black on watercolour paper and coloured with Distress Inks smeared on my craft sheet and misted with water and Perfect Pearls (Barn Door and Scattered Straw). I used a watercolour pencil for the skin. 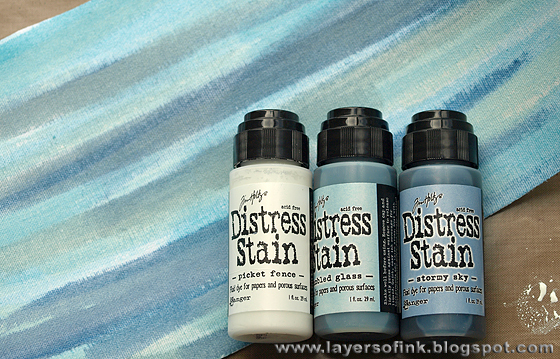 The spool was cut from grungeboard and streaked first with Sail Boat Blue paint dabber and then with Snow Cap. I added some bits and pieces from my scraps to the card (the doily, tissue paper, cheesecloth and sticky-backed canvas). 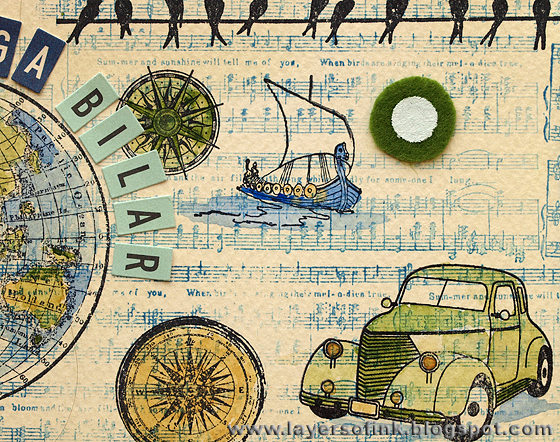 Supplies: Hero Arts stamps: Sew Stylish CL452, Painted People Background CG402; Sizzix Tag & Bookplates, Sewing Room, and Zig Zag 3D Pop-up Bigz dies; Distress Ink: Barn Door, Scattered Straw, Mustard Seed, Bundled Sage, Everygreen Bough, Frayed Burlap; Adirondack paint dabber Sail Boat Blue and Snow Cap; Ranger Archival Ink Jet Black and French Ultramarine; Tim Holtz terminology tissue paper and grungeboard; Ranger manila cardstock and white sticky-backed canvas; Derwent watercolour pencil; cheesecloth; twine; buttons. I stamped the bird with Archival Ink French Ultramarine and the legs with Versafine Onyx Black. Then I stamped the text repeatedly over the background using Malted Milk ink. The basket was stamped on patterned paper, cut out and mounted with foam adhesive. 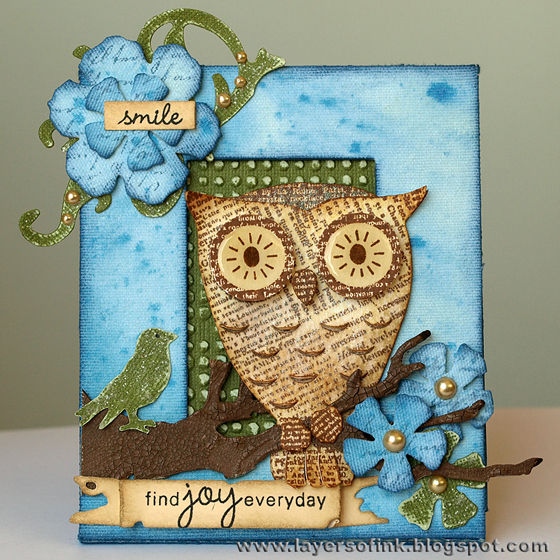 The frame was stamped on patterned paper and the sentiment stamped inside with the blue ink. The doily was misted with Stormy Sky reinker, Perfect Pearls and water. 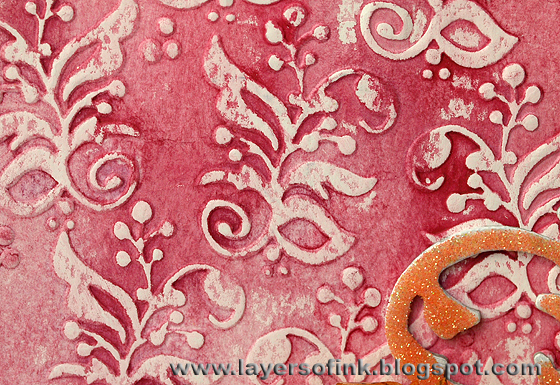 For the background I cut two pieces of printed kraft paper diagonally and then applied gesso on top through a stencil. I got it a bit too thick in places, but decided to use it anyway. 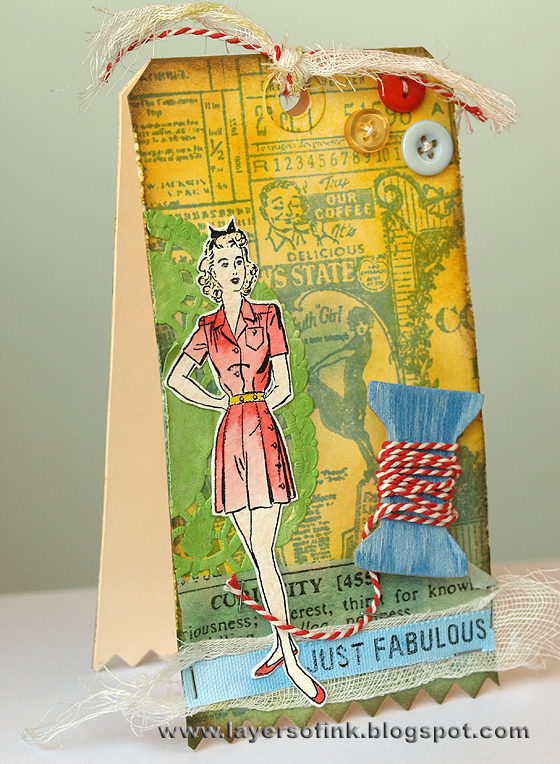 I even found a tiny clothes’ peg in my stash, same as on the sketch and fitting well with the baby theme. Thank you for looking! I hope you can play along with us this week, check out all the DT cards here. Supplies: Clear & Simple stamps Special Bundle; Archival Ink French Ultramarine; Jenni Bowlin Ink Malted Milk; Distress Ink Stormy Sky reinker; Perfect Pearls; Versafine Onyx Black; BasixGrey and MME patterned papers; The Crafter’s Workshop mini Cherry Blossoms stencil; doily; DMC embroidery floss; gesso; twine. The scene is done on glossy cardstock (8.5x11 inches) and coloured with dye inks using a Colorbox Stylus tool and Ranger craft nibs (for the small areas). Such a large scene using so many stamps (more than 20) requires a bit of planning, and I planned it out on scrap paper first. I knew I wanted to use the large moon stamp and the castle and needed to figure out a nice setting for the castle. All the stamping is done with Archival Jet Black ink. I use torn pieces of paper as masks where necessary. Since this is supposed to be a fairy tale setting, I left some items a bit out of proportion (the frogs are pretty big and the well is a bit small). As usual, I coloured it starting with the lighter inks and gradually building up darker colours. I started with Lemonade, which is a light yellow and then switched over to Weather Wane. For the orange shades Wild Honey and Spiced Marmalade were used. Then darker tones were added with Slate and Pitch Black. I left quite a lot of the white paper showing because I didn’t want the scene to be too dark. The moon is a yellow/orange harvest moon. Highlights were added with a white gel pen, lots and lots of dots. 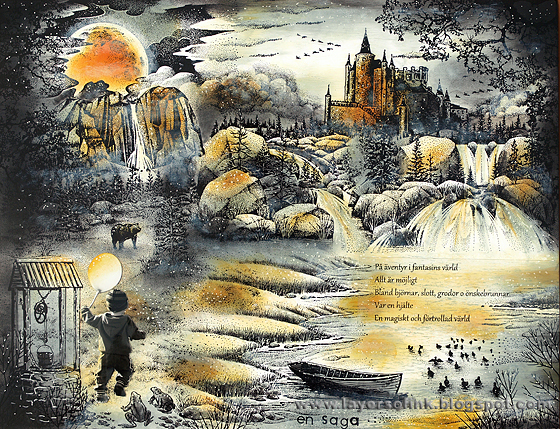 Then white pigment ink was dry brushed onto the scene to create shine around the moon, and mist here and there. The title was stamped with alphabet stamps and the journaling was printed on a transparency and placed on the water. I have a lot of photos of my son running, often away from me, so I was happy to use one of them. On this particular photo, he is carrying a balloon, which fit nicely with the scene. The light was also coming from the right direction. I cut him out and then applied a little bit of yellow and orange ink to the photo to make it blend in with the rest of the scene. Let me know if you have any questions about scenic stamping, it is lots and lots of fun to be able to create your own stamped landscapes. 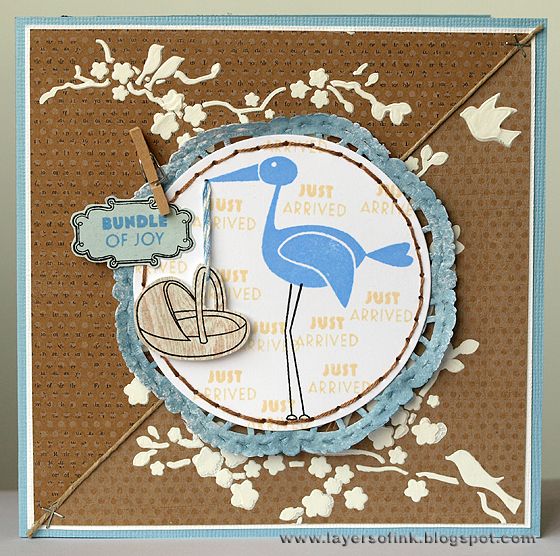 Supplies: Stampscapes stamps: Cascading Falls 015G, Cloud Cumulus 018E, Ducks in Formation 027A, Meadow Lg. 057G, Reeds 067B, Side Falls Lg. 075G, Tall Rock with Falls Lg. 082G, Waterside Bluff (left) 148F, Waterside Bluff (right) 149G, Bear 167A, Cloud with Rising Moon Lg. 198G, Oak Branch 203G, Flock in Water 225D, Water Pattern 231C, Sedge Filler 251C, Pebbles 256A, Prickly Branches 272G, Cloud Strips Sm. 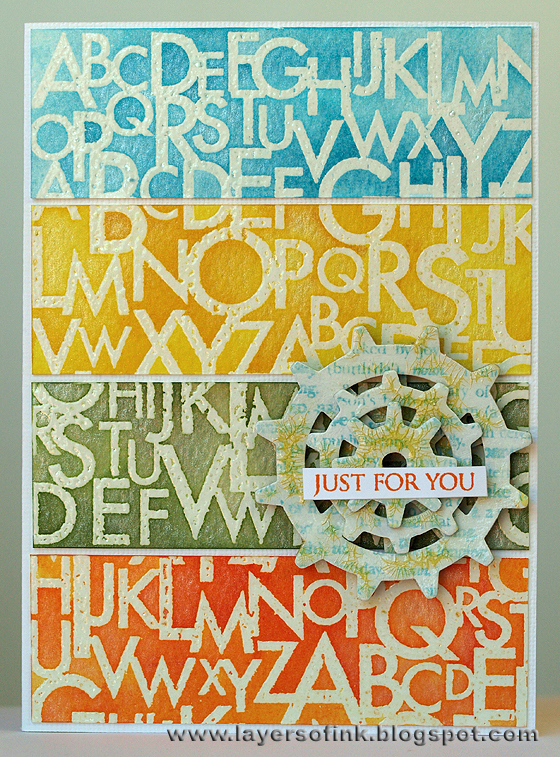 296C; Sutter stamps: Castle #2 H-1539, Old Well G-965; Beeswax stamps: Row Boat, Frogs; Hero Arts alphabet stamps; Adirondack dye inks: Lemonade, Slate, Pitch Black; Distress Ink: Wild Honey, Spiced Marmalade; Jenni Bowlin ink Weather Wane; Colorbox Frost White; white gel pen; Kromekote glossy cardstock; transparency. The skyline was stamped with Versafine and clear embossed. I pressed the stamp a bit hard, but decided to keep the image anyway because I really like the look of the watercolour background paper (a scrap from Distress Inks and water misted on my craft sheet and the paper being dragged into it). 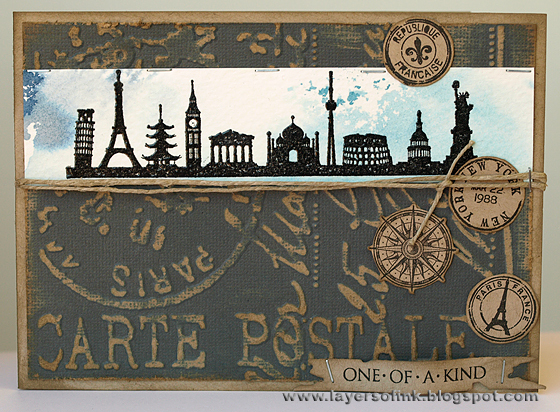 The travel related stamps were stamped on kraft paper and cut out. 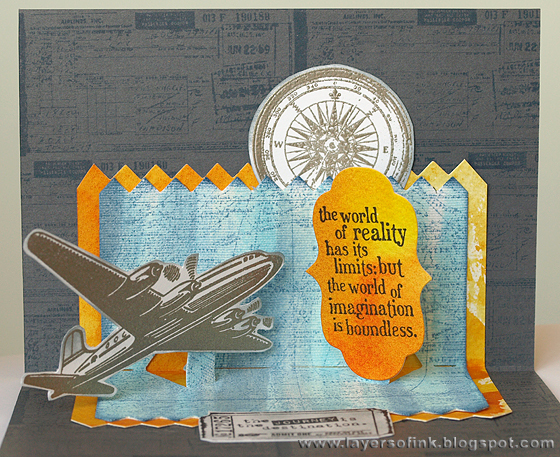 The background is kraft resist cardstock which was embossed with a postal folder and then sanded. 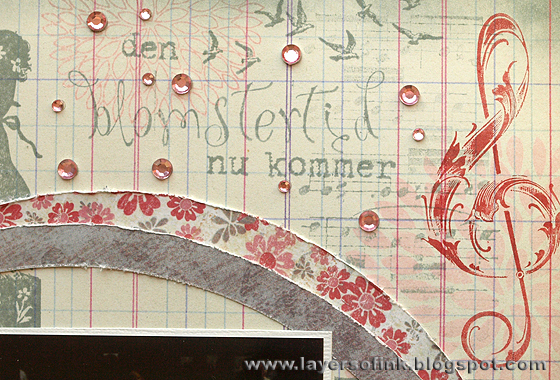 The sentiment is stamped on a tattered banners die cut. Supplies: Hero Arts stamps: International Skyline H5470, Untitled Heart AC002, Carte Postale CL535, Past Times AC007, Anytime Messages CL129; Sizzix Tim Holtz Distressed Frame & Postal set texture fade, Tattered Banners Sizzlits; Distress Ink: Tumbled Glass, Stormy Sky, Faded Jeans; Versafine Onyx black; Core’dinations Tim Holtz kraft core cardstock; watercolour paper; twine; mini attacher. 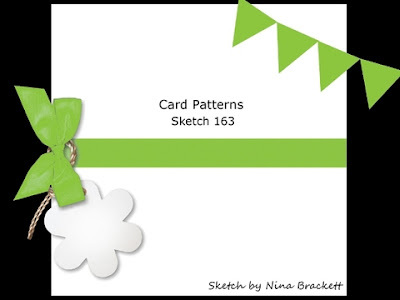 Today I have another card for the Hero Arts April challenge to share, this time using one of the challenge sketches. The alphabet pattern was clear embossed on watercolour paper. The paper was cut into four panels and each panel was coloured with Distress Stains (Broken China, Mustard Seed, Peeled Paint, Spiced Marmalade) and then misted with Perfect Pearls and water. 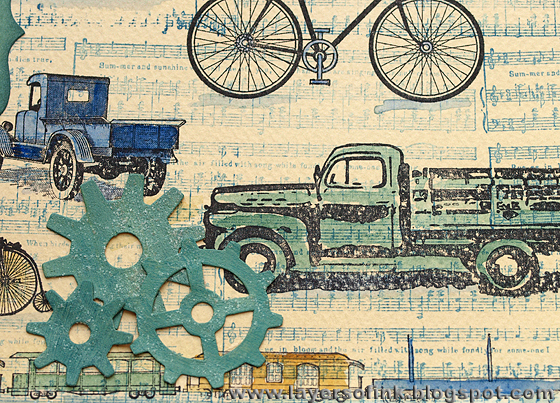 Four gears were cut from grungeboard, painted white and stamped with a text stamp using Archival Ink. Then the gears were painted with Distress crackle paint Rock Candy. After they dried, a bit of Mustard Seed Distress Stain was added to the cracks. 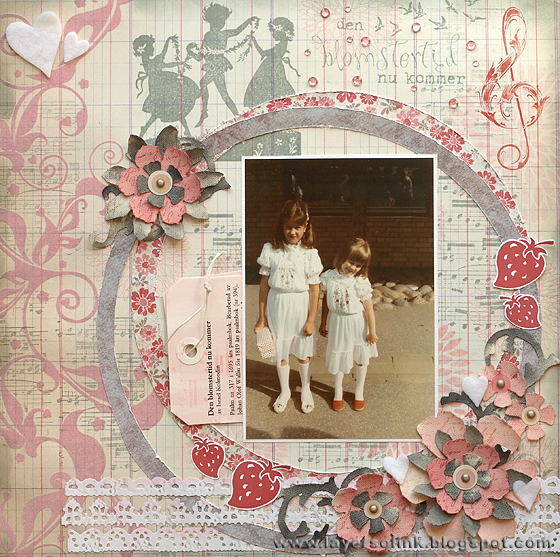 They were glued together and to the card with Glossy Accents. The base gear is hardly visible, but adds dimension to the card by lifting the other gears up. Supplies: Hero Arts: Alphabet Pattern ST501, Anytime Messages CL129, Happy Definition CG268; Sizzix Tim Holtz Gadget Gears Bigz and Mini Gears Movers & Shapers; Distress Stain: Broken China, Mustard Seed, Peeled Paint, Spiced Marmalade; Spiced Marmalade Distress Ink; Archival Ink Aquamarine; Distress crackle paint Rock Candy; white acrylic paint, grungeboard. The scene is done on glossy cardstock (17x12 cm) and brayered with dye inks. First, the two clouds were clear embossed. Then a circle was cut from masking paper and taped partly overlapping the one cloud, so that the sun would peak out from behind the clouds. The ground was masked off and the sky was brayered with the following inks: Summer Sky, Stonewashed and Danube Blue, making it darker at the top. The ink was wiped off from the clouds. The sky was masked and the ground was brayered with Willow. Then I used three torn papers as masks to make the hills, brayering in the following order: Lettuce, Meadow, Peeled Paint, Forest Moss, making each hill darker as it came closer to the front of the scene. This gives a sense of depth to the scene. The mask for the sun was removed and the sun was sponged with Lemonade, Lemon Drops and Wild Honey, making it darker in the centre. The yellow ink was wiped off from the cloud. The children were stamped with Archival Ink Jet black. 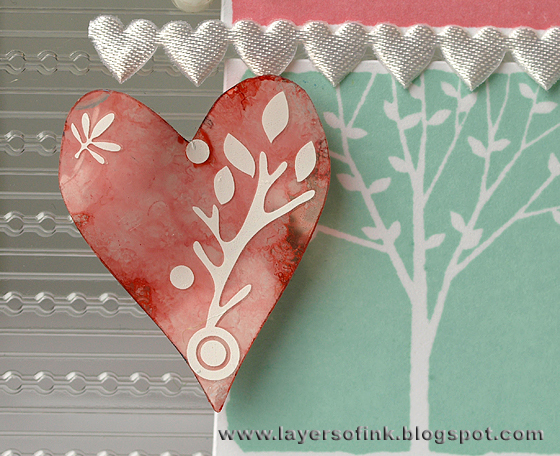 For the trees, I used a flower stamp, to add to the whimsical feeling of the scene. I like how the big flower trees make the children look pretty small. The trees were stamped with Archival Ink Olive, masking and restamping until the covered the length of the card. The grasses were stamped with the same ink. Then the sentiment and the birds were stamped with Jet Black. Highlights and flowers were added with gel pens (white, yellow and pink). I added a white dot in the centre of every flower in the trees. Finally, the children got a little kite cut from a dictionary book (page about ‘wind’) and I added another little strip from the dictionary as a path. 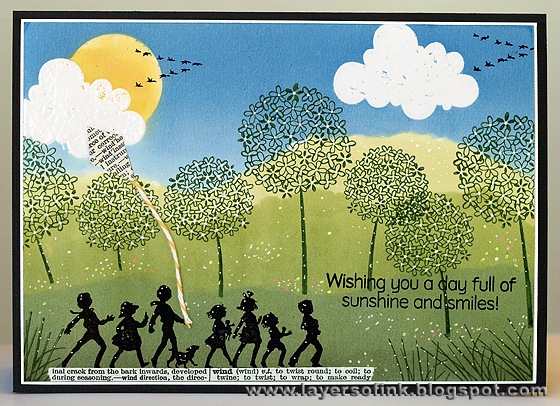 This card has similarities with these two cards of mine: Autumn Silhouette Scene and Winter Children. Thank you for looking!! Have a day full of smiles & sunshine! 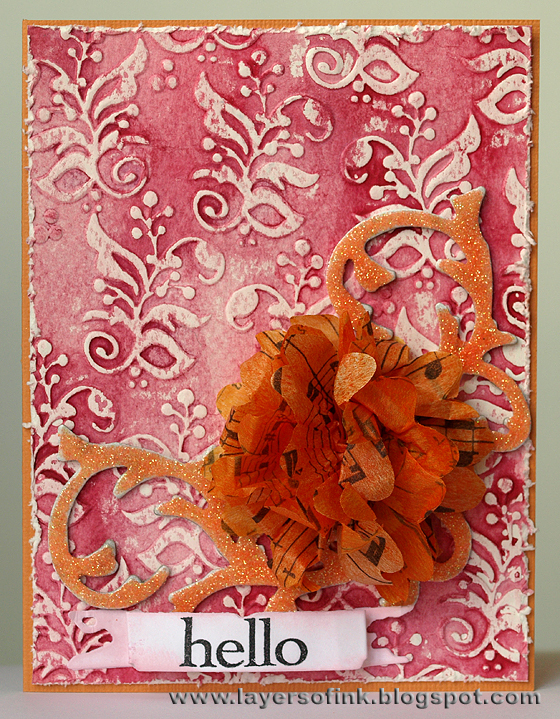 Supplies: Hero Arts Three Flower Balls K5598, It’s a Parade G5469, Sending Smiles Messages CL490, Halloween Moon CG369; Stampscapes: Ducks in Formation 027A, Reeds 067B; Adirondack ink: Stonewashed, Willow, Lettuce, Meadow, Lemonade; Distress Ink: Peeled Paint, Forest Moss, Wild Honey; Jenni Bowlin: Lemon Drops; Memento: Summer Sky, Danube Blue; Ranger Archival Ink Jet Black, Olive; clear embossing powder; Speedball brayer; Kromekote glossy cardstock; white, yellow, pink gel pens; old dictionary; baker’s twine. The trees were inked with Versamark and then grey was added here and there to the edges with a grey marker before stamping on glossy cardstock. The trees were clear embossed, burying the grey marks underneath the embossing. The same grey marker was used to add the grey marks to the tree. I sponged the following inks on the sky (first masking the ground off): Aqua, Speckled Egg, Stormy Sky, Slate, using a ColorBox Stylus tool. Wipe the ink off the trees. For the grounds I used these inks: Willow, Bamboo Leaves, Peeled Paint, Forest Moss. Flowers were added to the ground with a white gel pen. 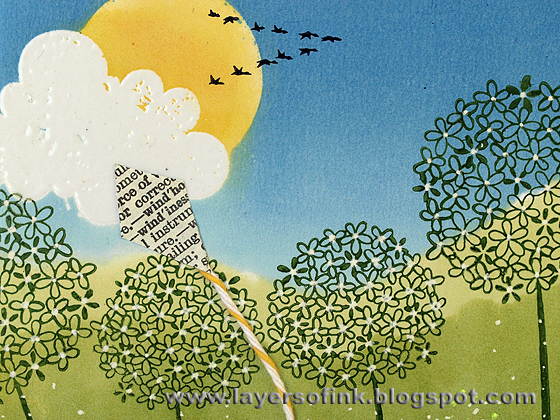 The Friend Definition was stamped on white paper using Weather Wane ink and the birds come from a border punch. The sentiment was white embossed on a piece of glossy cardstock which had been inked with Weather Wane. It is really fun to work with dye inks on white glossy cardstock, you should try it out if you haven’t yet. 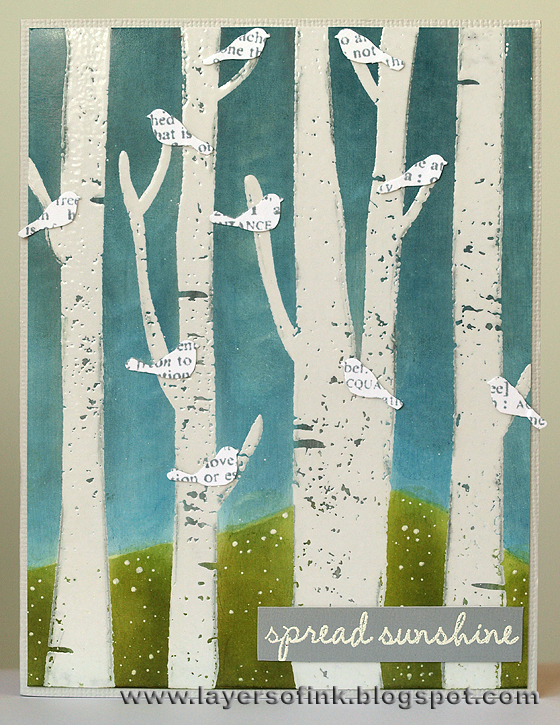 Supplies: Hero Arts stamps: Tree Trunks S5477, Friend Definition CG125; Anytime Messages CL129; Adirondack inks: Aqua, Slate, Willow; Distress Ink: Stormy Sky, Peeled Paint, Forest Moss; Jenni Bowlin: Weather Wane, Speckled Egg; Memento: Bamboo Leaves; Memento Marker London Fog; Colorbox Stylus tool; white gel pen; Martha Stewart Birds on a Wire border punch; Kromekote glossy cardstock.